Home » Video » Let’s never forget the Mavi Marmara Massacre! Let’s never forget the Mavi Marmara Massacre! On the night of Sunday, May 30, 2010 showing a terrifying disregard for human life, Israeli naval forces surrounded and boarded ships sailing to bring humanitarian aid from Turkey to the blockaded Gaza Strip. On the largest ship, the Mavi Marmara, Israeli commandos opened fire on civilian passengers, killing at least 9 passengers and wounding dozens more. Others are still missing. The final death toll is yet to be determined. Cultures of Resistance director Iara Lee was aboard the besieged ship and has since returned home safely. Despite the Israeli government's thorough efforts to confiscate all footage taken during the attack, Iara Lee was able to retain some of her recordings. 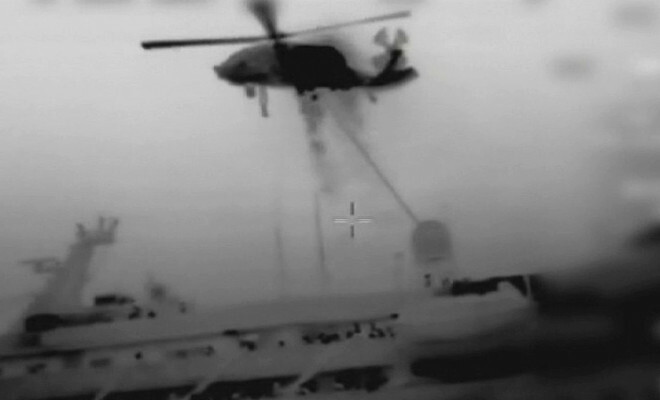 Above is raw footage from the moments leading up to and during the Israeli commandos' assault on the Mavi Marmara. One of the passengers who was severely beaten is named Kenneth O’Keeffe who once served as a US Marine and is now a peace activist who stands in solidarity with Palestine and against the Zionist extremism. This video shows how badly he was beaten.